I had spent the first two hours visiting The Citadel area and the Quadrangle. It was a bit past 11 and, given the relative lack of shade, I was noticing the heat as I wandered the sites and bicycled the roads between them. Yet to come were some impressive dagobas, image houses, and 3-D Buddhas carved out of the granite rock face. I left the main road and headed down the path to Shiva Devale no. 2 – Here is a Youtube clip which nicely illustrates the ride! 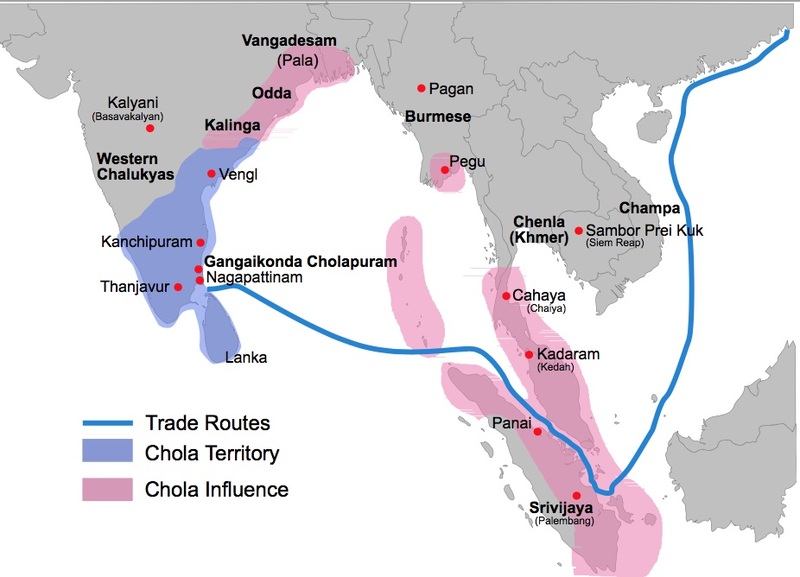 Chola Empire around 1100 C.E. 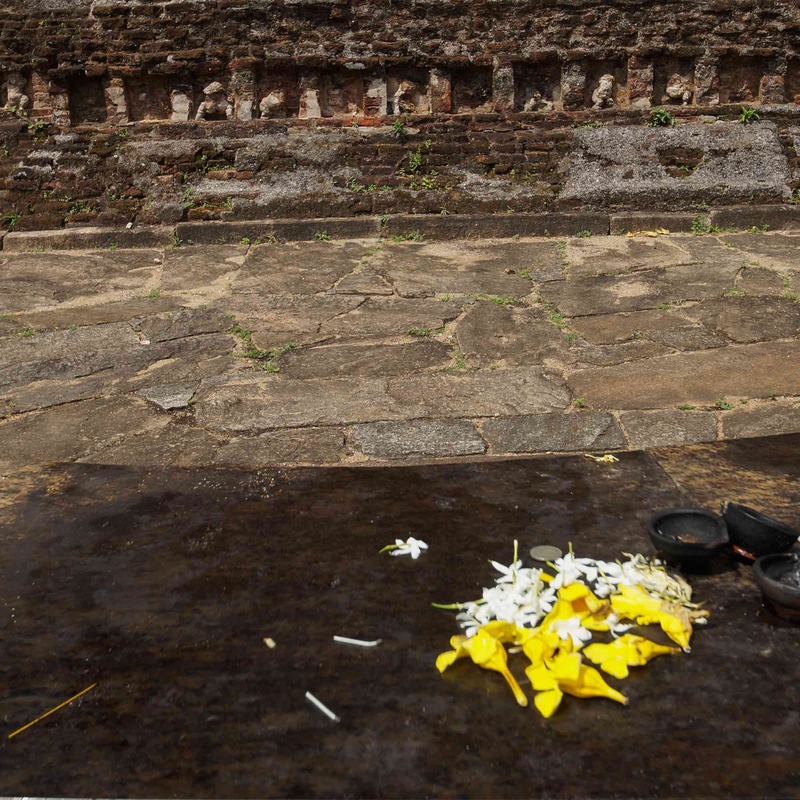 It is not the only Hindu temple in the ancient city – Shiva Devale No. 1 is just in between the Citadel and the Quadrangle but I hadn’t visited. And later I would cycle by small temple ruins dedicated to the Hindu gods Vishnu and Ganesha. 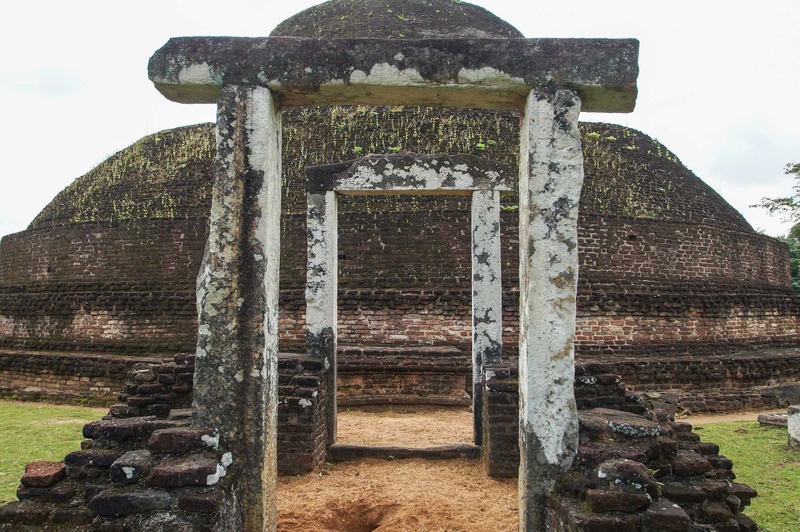 They had been constructed during the three-quarters of a century that the Cholas (a south Indian Hindu Tamil dynasty) had ruled much of the northern and central part of Sri Lanka. Shiva Devale no. 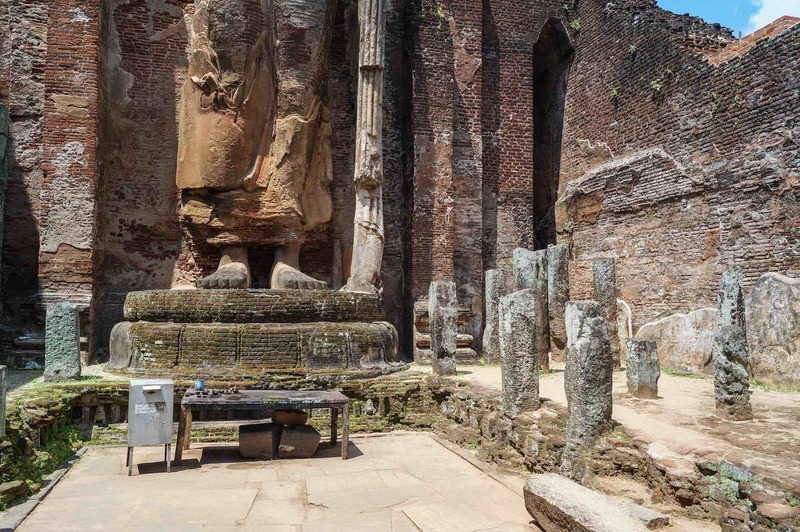 2 is said to be ancient Polonnaruwa’s oldest surviving building, and dates to the early 1000’s C.E. 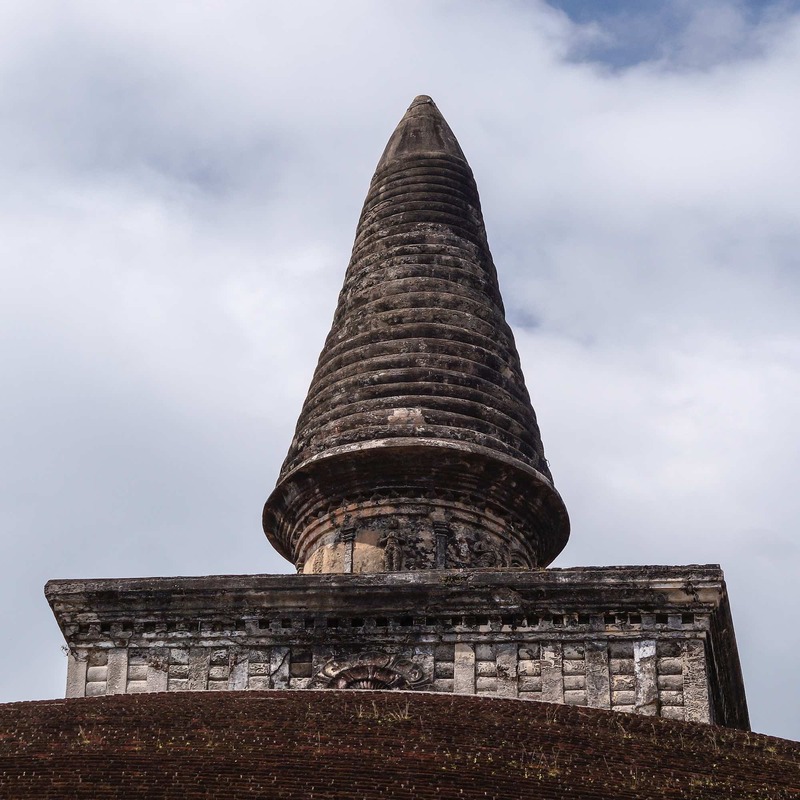 It was apparently meant as a memorial to one of the queens of the Chola king Rajaraja, who led the Indian invasion which destroyed Anuradhapura in 993 and established a power base in Polonnaruwa. Unlike the bricks and mortar construction of a Sinhala temple, this one features Indian-style solid stonework. Visible behind the temple are two of the Nandis associated with the temple. Looking at the Joseph Lawton photo from 1870, it is clear that some restoration work has been done over the past 150 years, especially on the dome. My photo is of the front of the temple; Lawton’s shows the back and one side of the structure. Shiva Devale No. 2 ©Victoria and Albert Collection. London. 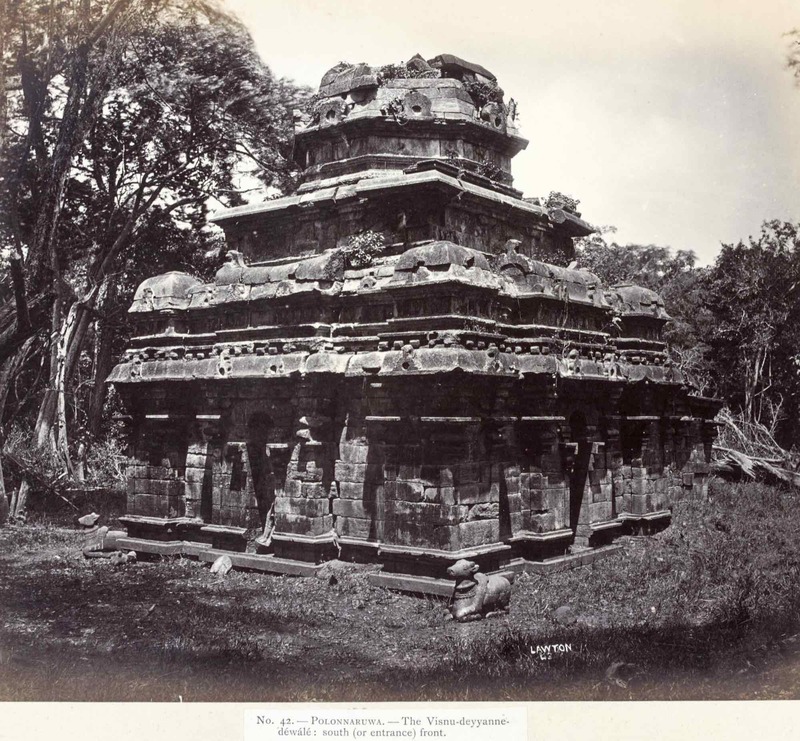 Lawton mislabeled the temple as a Vishnu temple. The Nandi figures and the lingam are associated with Shiva, the aspect of the Hindu Godhead (the Trimurti) associated with death and destruction. 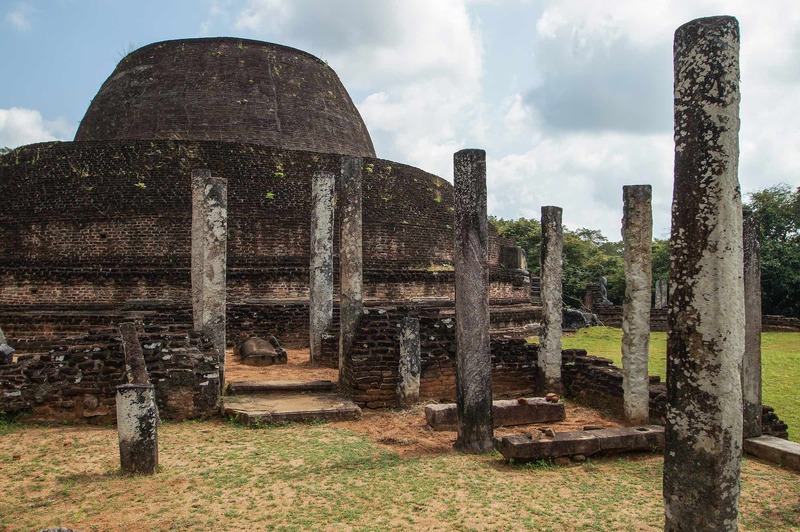 Not far from the Shiva temple are the remains of a monastic community with an impressive – the third largest in Polonnaruwa – brick dagoba. Modern renovations have turned it into a two-leveled structure with a rather flat top. 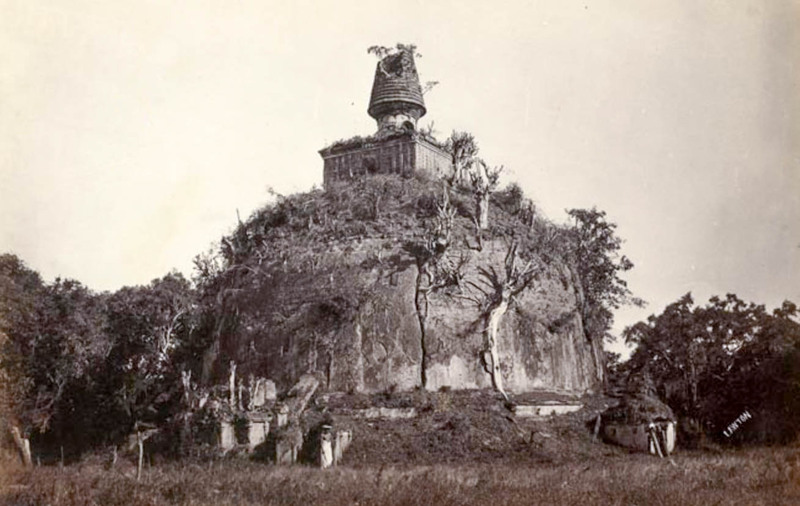 It would be interesting to see a photo of the dagoba from 1870 in order to see what it looked like before it was reconstructed. Going further north we now leave the confines of the walled ancient city and come to one of the many monastic communities which were established around image houses and dagobas. 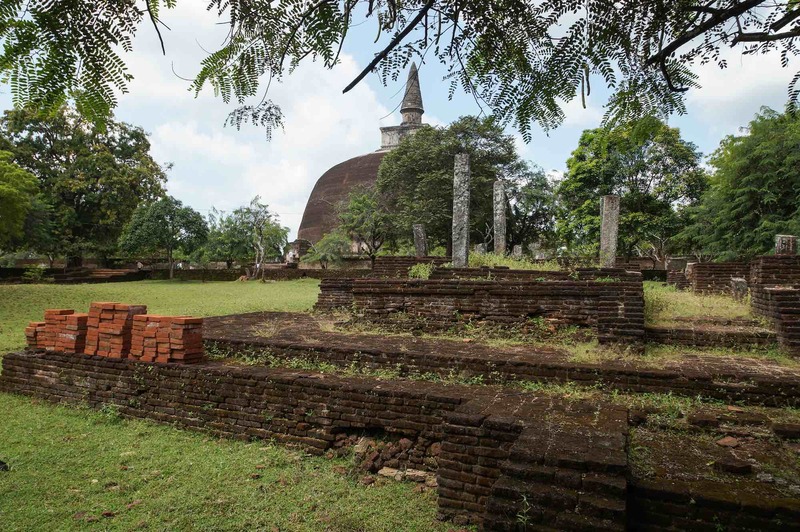 I passed by the ruins of the Menik Vihara and headed for Rankot Vihara. 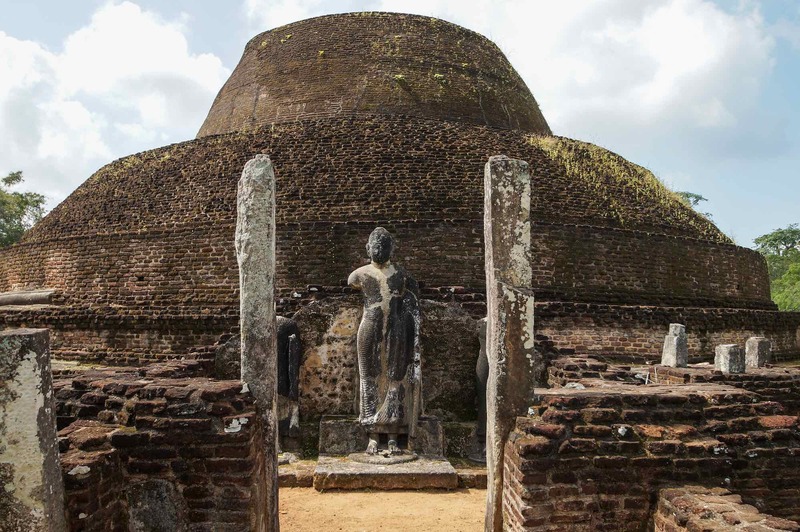 The glory days of Polonnaruwa revolve around three rulers. The first was Vijayabahu I (circa 1070-1110), who defeated the Chola (i.e. Indian Tamil) invaders who had built up the city as their capital and had ruled for a half-century. After a period of civil war he was followed by Parakramabahu I (1153-1186), the most successful and ambitious of the three. During his reign, sometimes labeled as the city’s Golden Age, much of what is visible in the ruins of the ancient city was built. He was followed by Nissanka Malla I (1187-1196). His nickname The Vainglorious sums up his reign. 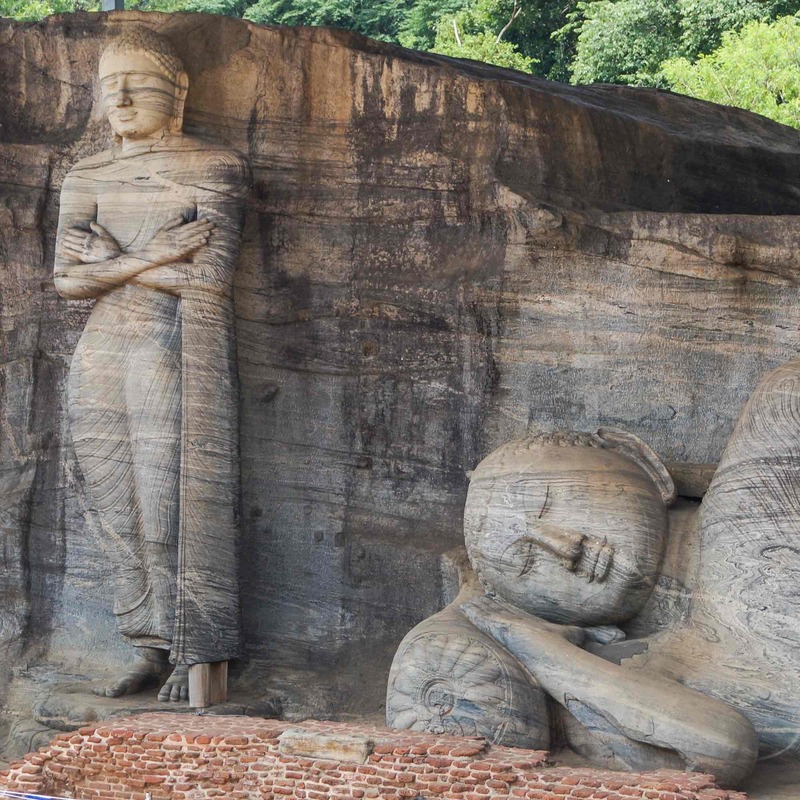 After these three effective rulers, a series of weak and ineffective ones eventually ended with the invasion of yet another Indian kingdom (the Kalinga) which put an end to Polonnaruwa as the Sinhalese fled the city for points further south. The construction of the dagoba at the Rankot Vihara is attributed to Nissanka Malla I. 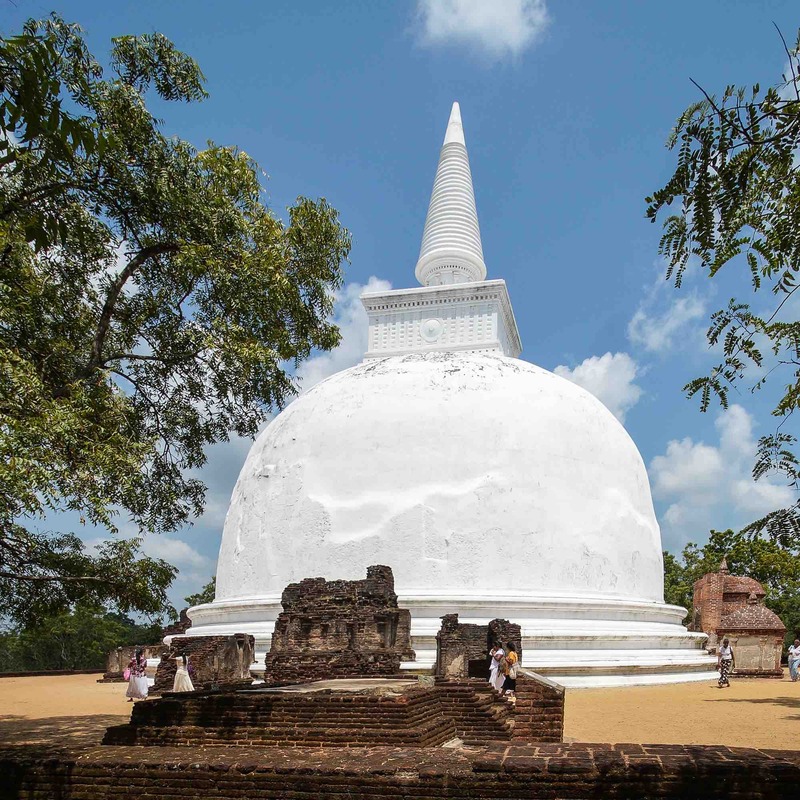 It follows the classic design of the Anuradhapura dagobas of a thousand years before and, next to that ancient city’s massive stupas, is the fourth largest in Sri Lanka. Its base diameter is 170 meters (550 feet) and as it stands now it is 33 meters (108 feet) high. On top of the anda (the dome-shaped bottom) sits the square harmika and on top of that the spire. 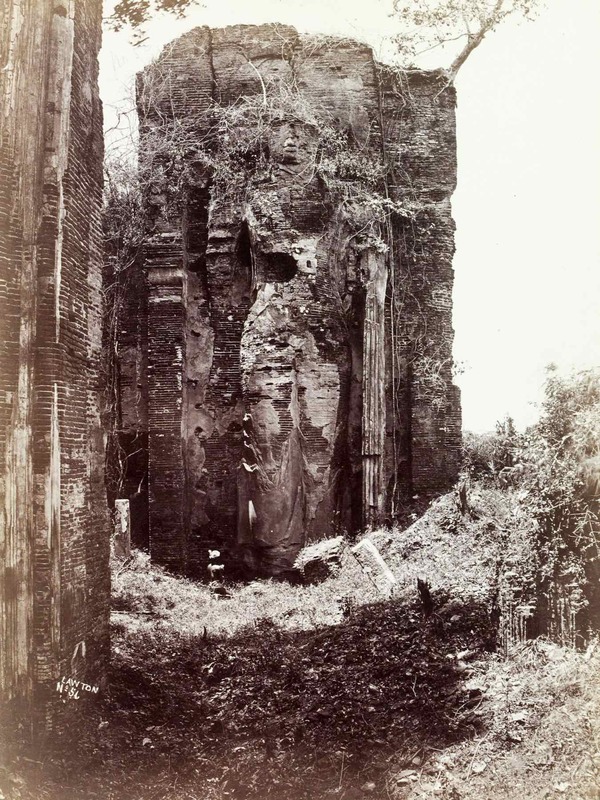 The image below shows the extent to which the structure was overgrown in the 1870’s when the British photographer Joseph Lawton visited the area and made his remarkable images. 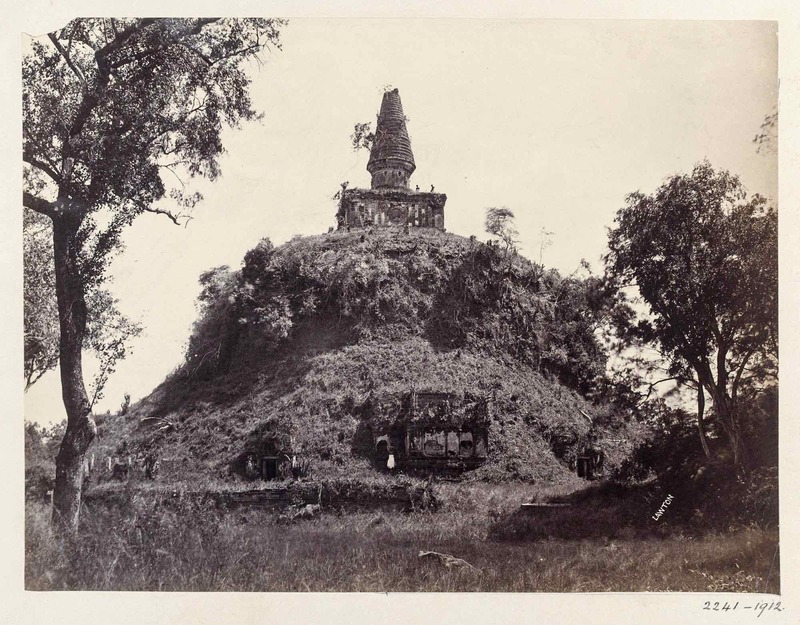 The Rankot Dagoba – a photograph by Lawton 1870-71.©Victoria and Albert Collection. London. Surrounding the base of the stupa are small shrines, some still the object of worship by visiting Buddhists. The photo below is of the main shrine on the north side of the dagoba. To its left one of the secondary shrines is visible. 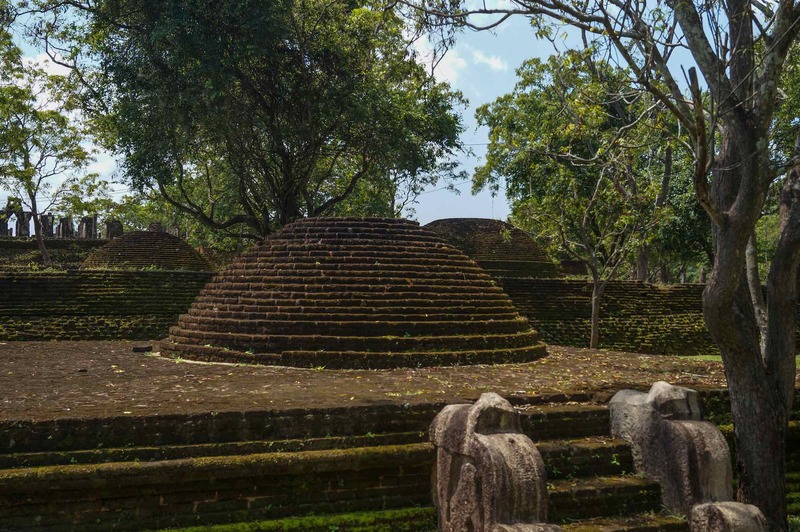 The dagoba is essentially a mound of earth and dirt covered with a skin of brick and mortar. 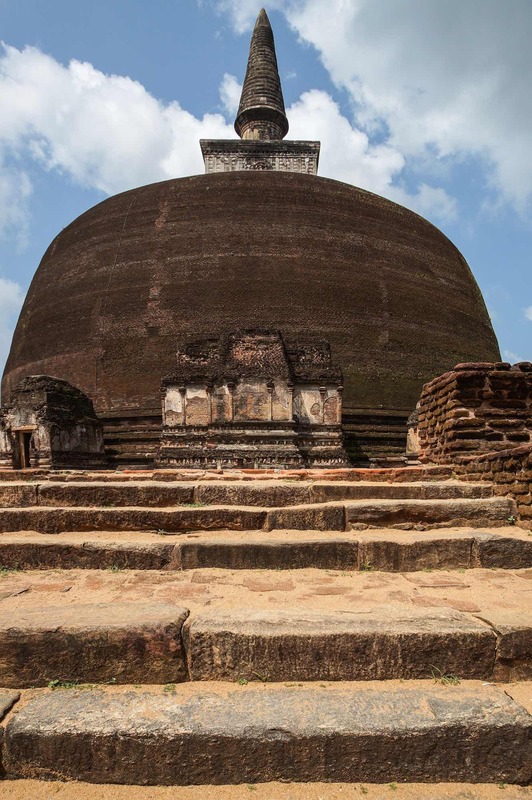 Somewhat squat in appearance, it lacks the more semi-spherical look of Anuradhapura’s stupas. The name Rajkot is apparently derived from two Sinhala words – ran meaning “gold” and kotha meaning “pinnacle”. These days there is no gold leaf covering the brick and mortar spire. From the Rajkot Dagoba, it was a short ride to the monastery area named Alahana Pirivena. The image below shows some of the mini-stupas on terraces not far from the Lankatilaka. The monastery was associated with cremation rituals and the stupas may be those of those of the city’s upper class. Also visible on the middle left of the image are standing columns of one of the monastic residences that would have existed. As I approached the Lankatilaka, Sri Lanka’s most impressive gedige or image house, I thought of similar temples built to house statues of Zeus and Athena in ancient Greece. There too the statues were so tall that their heads just fit under the roofs of the structures built to house them. Much of Athena’s temple – the Parthenon in Athens – still stands but the statue is no longer there. And nothing remains of Zeus’ temple in Olympia or of the statue of Zeus, considered one of the seven wonders of the ancient Greek world. Here we have the brick walls and back of the temple still standing. 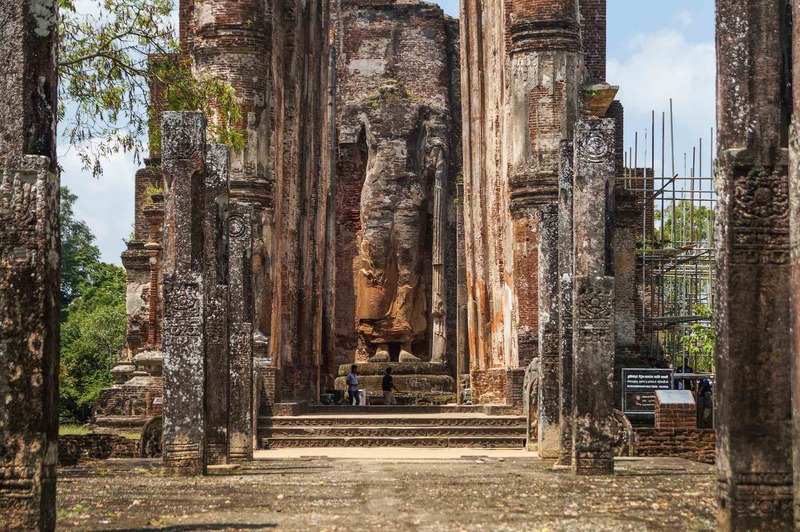 The wooden roof is no more and most of the standing Buddha figure – built of brick and then more finely sculpted with stucco – has not survived. Lankatilaka – Joseph Lawton photo from 1870-71. ©Victoria and Albert Collection. London. 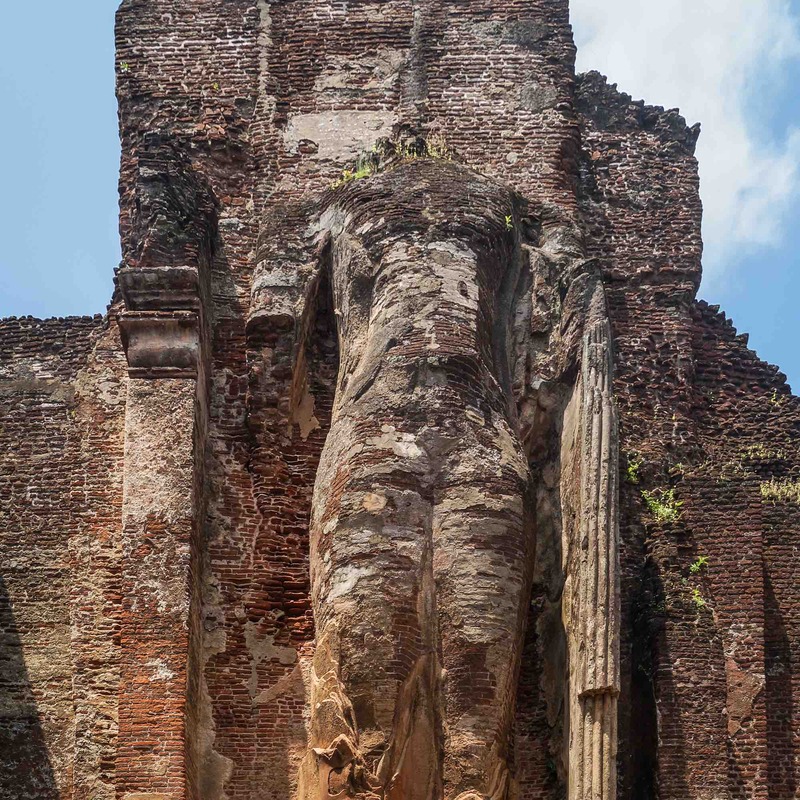 The Lankatilaka, one of the main structures built during the reign of Parakramabahu I, had as its focal point the 15 meter high standing Buddha, standing on a lotus pedestal. He was probably shown in the common “Have No fear” mudra (pose) with his right hand raised and open. 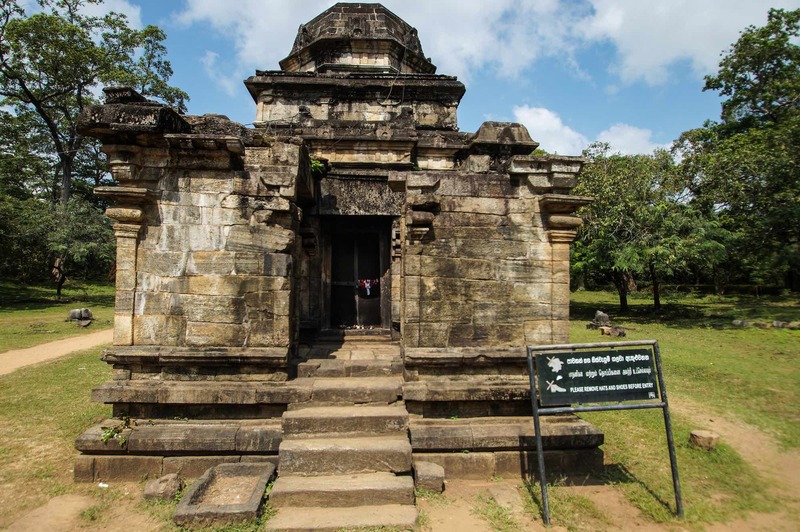 Just to the north of the Lankatilaka is the next of Polonnaruwa’s sites, the Kiri Vihara. These days it is a gleaming white stupa, thanks to a recent paint job. It was somewhat overgrown when photographed by Joseph Lawton in 1870, but the shrubs and trees that had somehow rooted themselves in the cracks between the bricks have been cleared. Do note that visitors are required to remove their footwear when entering any grounds considered sacred. It was now about 1 in the afternoon and I still remember the heat of the bricks on the terrace burning the bottoms of my feet as I walked around the stupa. To deal with the heat, those not accustomed to walking barefoot – i.e. most westerners – sometimes bring socks to wear. It would be interesting to know if this “solution” is acceptable – or if it still considered disrespectful in the eyes of the locals. On another note, I did walk around the stupa clockwise as seems to be the custom in Sri Lanka (but not, I might add, at Buddhist sites in Myanmar, where other taboos seem to be more important). Kiri Vihara Dagoba. Joseph Lawton photo. ©Victoria and Albert Collection. London. Back on the bike again, I headed over to what would be my last site visit of the day. Somewhat dehydrated, needing some lunch, and feeling the heat of the day, I had hit my limit. I am glad, however, that I did not turn back right then and there but headed over to the Gal Vihara Buddhas. 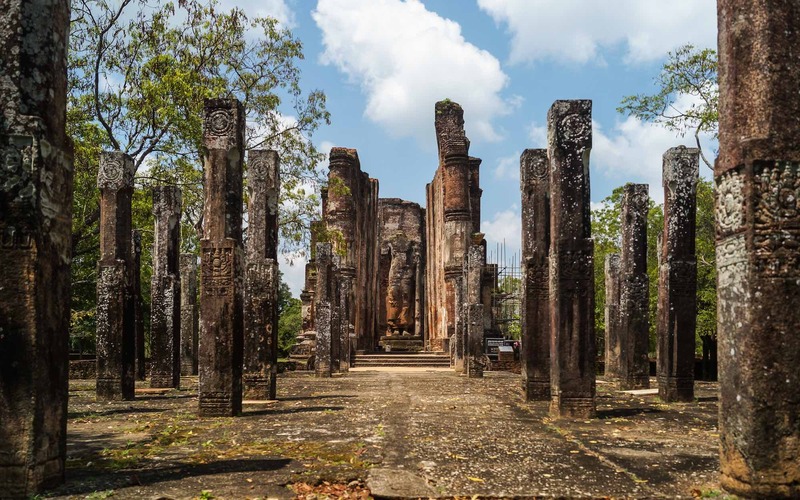 What I would see is the most impressive of Polonnaruwa’s various sites – superbly executed rock carvings on a large-scale which are still in remarkable shape given their age. 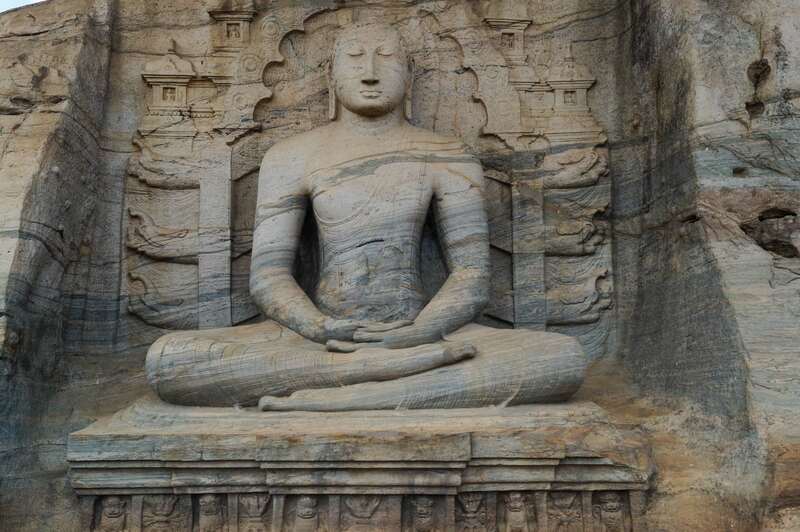 Carved into a south-facing granite rock face is a series of Buddha figures in various poses. The images above and below show the first of the four – a seated Buddha shown in the meditation pose (Dhyana mudra) and in the state known as samadhi. The 4.6 meter high (15′) figure was originally contained within an image house built around it. Parts of the brick wall foundation and a few sockets where wooden beams would have been inserted into the rock face are still evident. 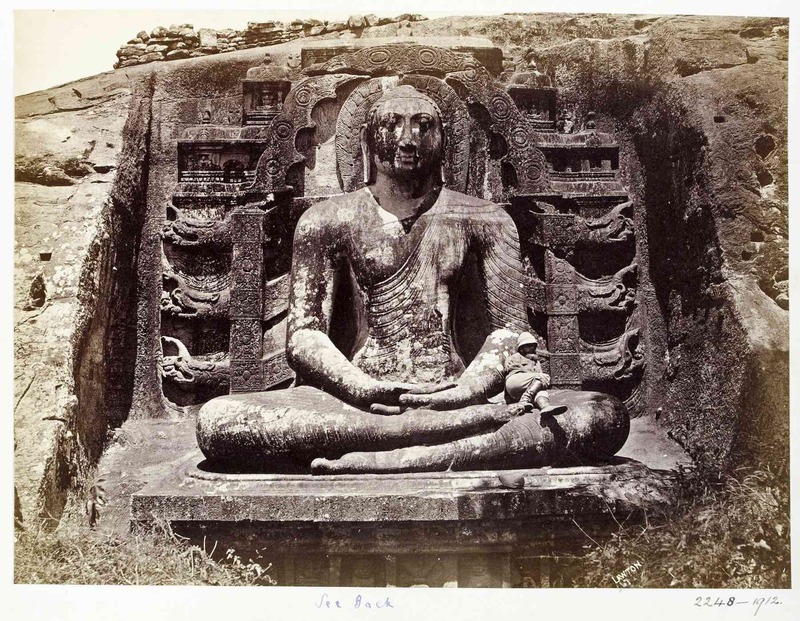 Gal Vihara seated Buddha figure – ©Victoria and Albert Collection. London. 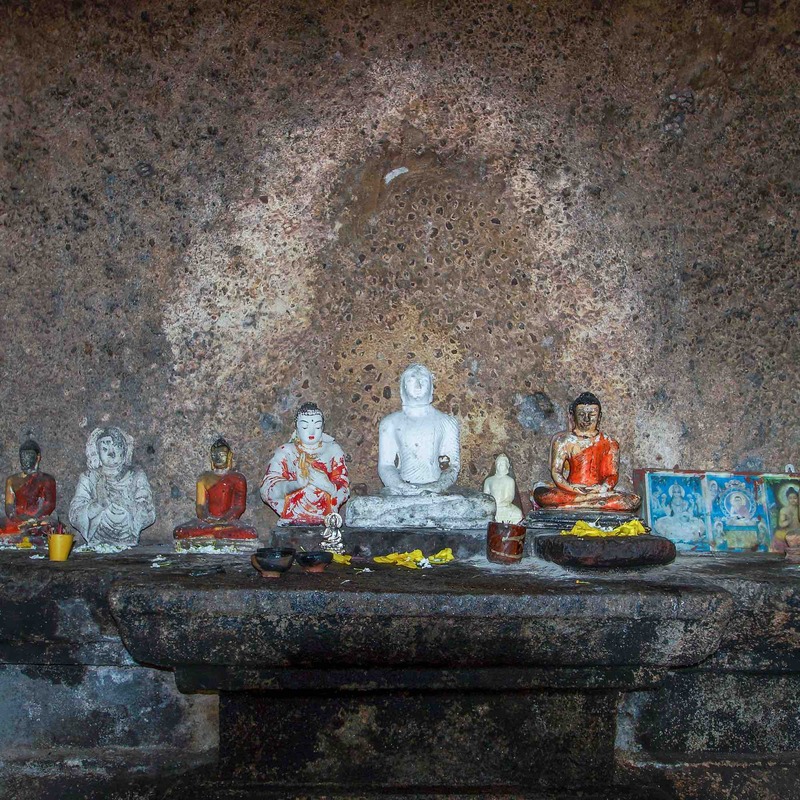 Next to the seated Buddha – and inside an artificial cave cut into the rock – is another seated Buddha in the same pose. It is apparently 1.4 meters high (4’7”). The area was not open to the public when I was there. The image below shows the entire Gal Vihara site with the seated outdoor Buddha on the extreme left and then the scaffolding in front of the Samadhi Buddha in the cave. Also visible are a standing Buddha figure and a reclining Buddha. The standing Buddha, once thought to be a representation of Ananda, the faithful disciple of the Buddha, is now held by most to be a standing Buddha figure. Evidence of a separate image house enclosing the figure and separating it from the reclining Buddha break the apparent connection between the two. Somewhat puzzling is the unusual crossed-arms mudra that the figure is depicted in – it is not one I have ever seen. 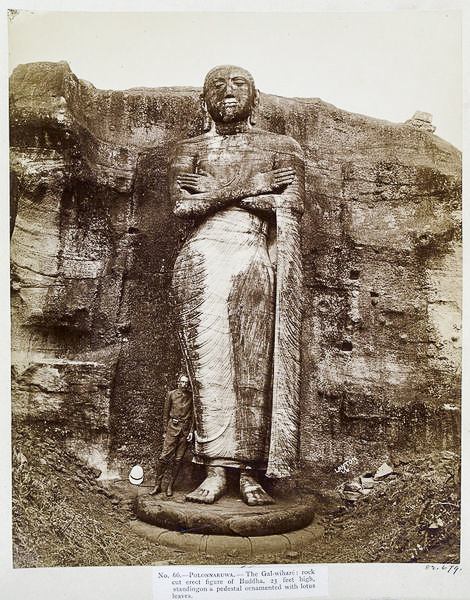 standing Buddha or Ananda at Gal Vihara – ©Victoria and Albert Collection. London. An interesting point mentioned in a Wikipedia article on the site (click here to read) is that the carvings may originally have been covered with gold leaf. This would definitely have given them a glow within the confines of the candle-lit image houses that would have been the worship focal point of the monks whose residences surrounded the carvings. 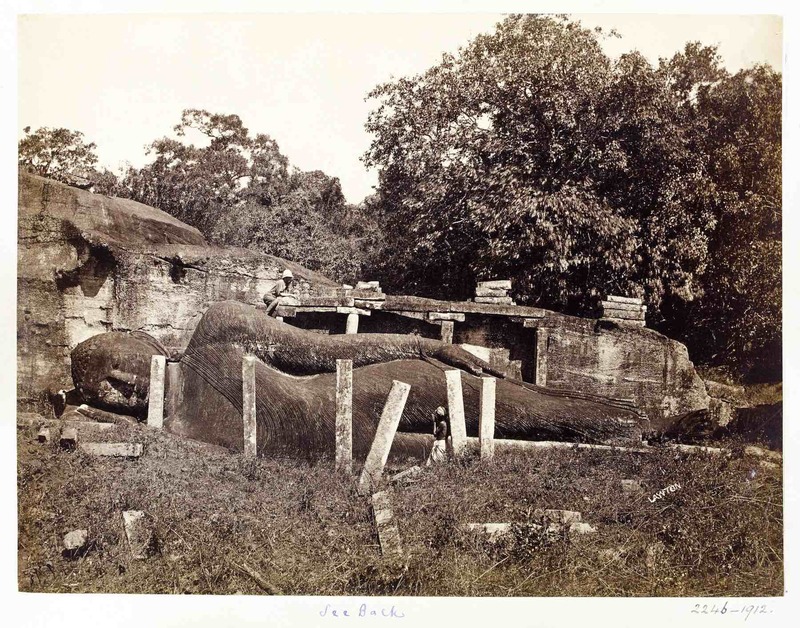 reclining Buddha figure at Gal Vihara in Polonnaruwa – ©Victoria and Albert Collection. London. I had been on the move for over five hours by this point. 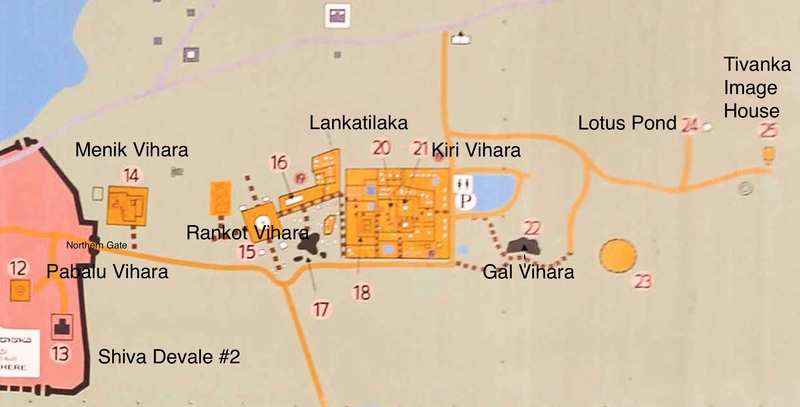 I looked at the map and checked my Rough Guide to Sri Lanka guidebook to see what else I should get to – the Lotus Pond and the Tivanka Image House. Given how I was feeling – and given the heat of the afternoon – I decided to turn back to the entrance and my waiting taxi driver. 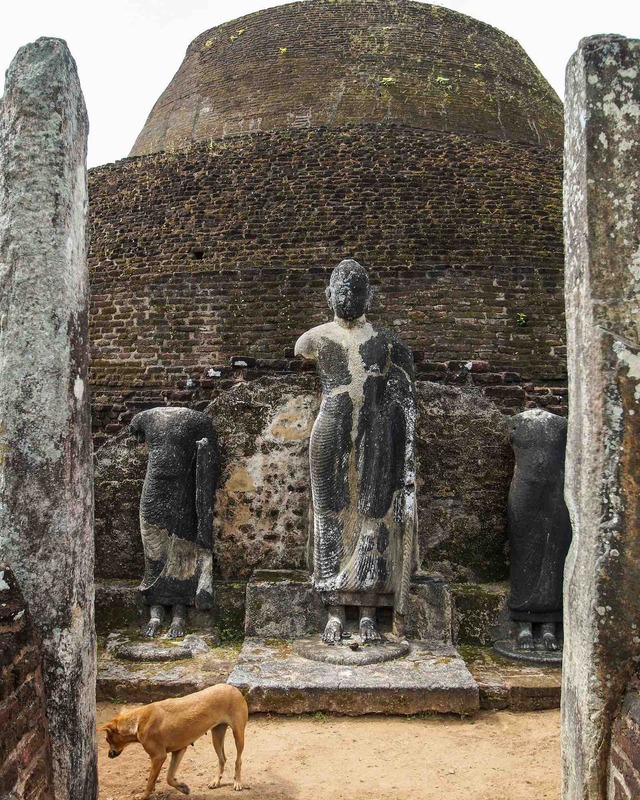 As I mentioned at the start of the first Polonnaruwa post, I regretted not just using my taxi driver for the day – or even better, having come to Polonnaruwa the night before to allow for an earlier morning start with a tuk-tuk driver as my guide and transportation. My day with the ruins of ancient Polonnaruwa had been absolutely worth it. 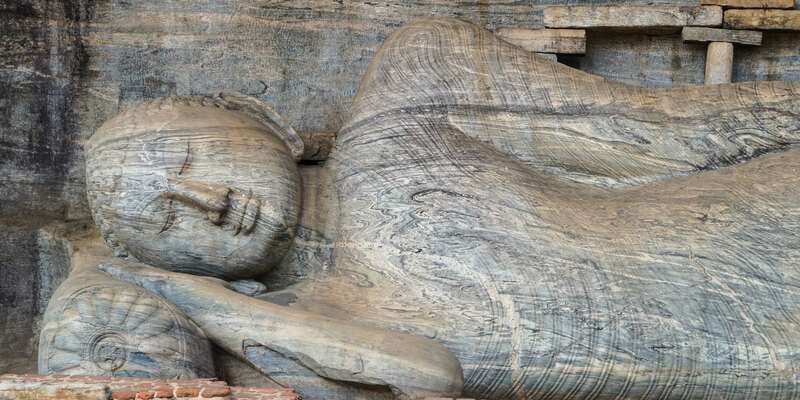 Along with another day spent in Anuradhapura and most of a day at Sigiriya, my visit provided me with a better idea of the impressive accomplishments of the Sinhalese people of a thousand and two thousand years ago. The builders of stupas which rivaled the pyramids of Egypt in size and the guardians and transmitters of the Buddha’s teachings to other parts of Asia from their vibrant viharas – certainly a legacy to be proud of.